Thompson / Center Arms® Natural Lube 1,000 Plus Bore Butter Seasoning Patches. 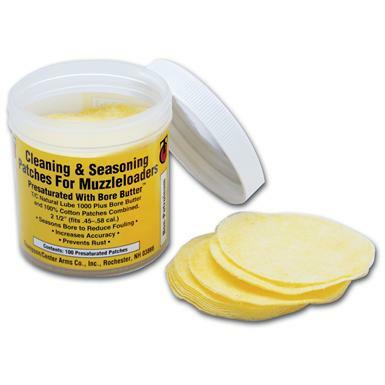 Great for use after cleaning your muzzleloader! 2 1/2" diameter, 100% cotton cleaning patches saturated in Natural Lube 1,000 Plus Bore Butter. Also perfect for easy field cleaning. Seasons the bore with repeated use. Works well with .45-.58 muzzleloaders. Comes in jar of 100. Order a jar or two ONLINE today! T/C Arms Natural Lube 1,000 Plus Bore Butter Seasoning Patches is rated 4.4 out of 5 by 7. Rated 2 out of 5 by Stogunner from Ok to clean The patches seemed to be very dry, doesn't clean well. More solvent is necessary. Rated 5 out of 5 by TOM from no mess no fuss. gr8 for in the field cleaning. will buy again!!!!! Rated 4 out of 5 by RALPH P from Used before. Great product.